The Aldi’s store at 6300 Brandt Pike will re-open to customers on Monday, March 25 following a closure for renovation. HUBER HEIGHTS — ALDI welcomes shoppers back to its renovated Huber Heights store when it reopens on Monday, March 25. The store, located at 6300 Brandt Pike, is part of a $1.9 billion initiative to remodel and expand more than 1,300 ALDI stores nationwide by the end of 2020. 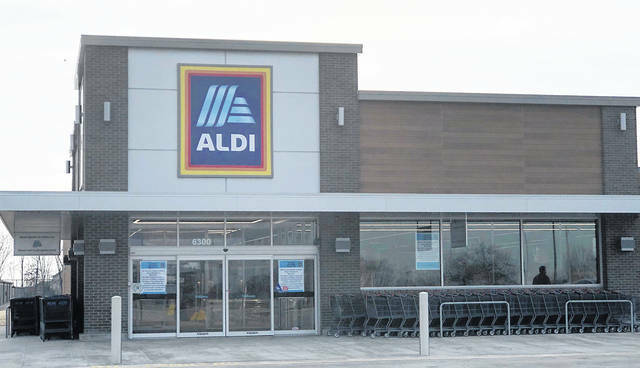 To celebrate the Huber Heights store reopening, ALDI will host a ribbon-cutting ceremony on Monday, March 25, at 8:30 a.m., followed by its popular Golden Ticket giveaway, offering gift cards to the first 100 customers, and a complimentary eco-friendly bag distribution. Shoppers can also sample ALDI-exclusive brand foods and enter a sweepstakes for a chance to win a year’s supply of ALDI produce. The updated Huber Heights ALDI store layout provides an improved in-store experience and features additional refrigeration space to accommodate even more fresh, healthy and convenient products. Additionally, 20 percent of the ALDI product selection is new. The recent ALDI product expansion is the next phase of the company’s aggressive, national growth and remodel plan. As part of the product expansion, ALDI increased its fresh food selection by 40 percent with many organic, convenient and easy-to-prepare options. ALDI stores also feature open ceilings, natural lighting and environmentally-friendly building materials. The store will be open from 9 a.m. to 9 p.m. Monday through Friday and from 9 a.m. to 8 p.m. Saturday and Sunday. ALDI stores are designed to save shoppers both time and money. ALDI carries a streamlined selection of exclusive products and national brands, which removes guesswork from shopping and enables customers to find exactly what they need. ALDI also offers specialty items that make the hottest food trends affordable and accessible, and has earned more than 300 product awards and recognitions for its exclusive brands since 2017.